Construction management is an overall coordination, planning and control of a project. To deal with the intricacies of such a project, a form is required. 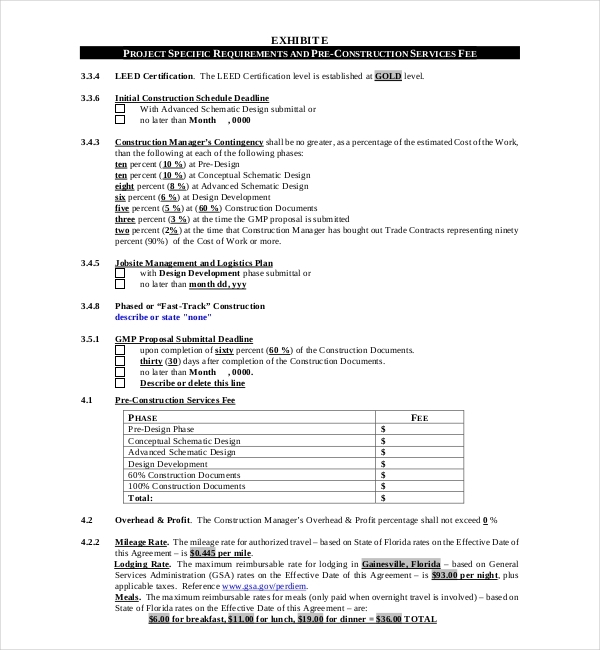 Construction Management Forms are for pre-panning of the whole project. Everything related to the project is decided and shown via this form. The requirements in the construction project, payment, budget, schedule etc are discussed. Nowadays, you can get these forms in a website as well. There are different types of Construction Forms available. 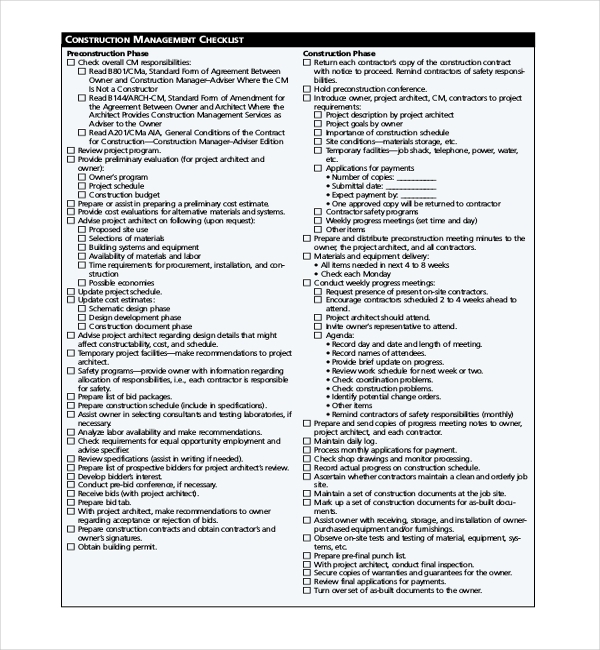 The construction management checklist covers various aspects of the project that are important for a project. The review of the project is done, budget and payments are discussed. The safety norms, agenda of the project, materials required, design, permits, project goals of owner etc are needed to be check listed. It gives a short idea about the whole project. 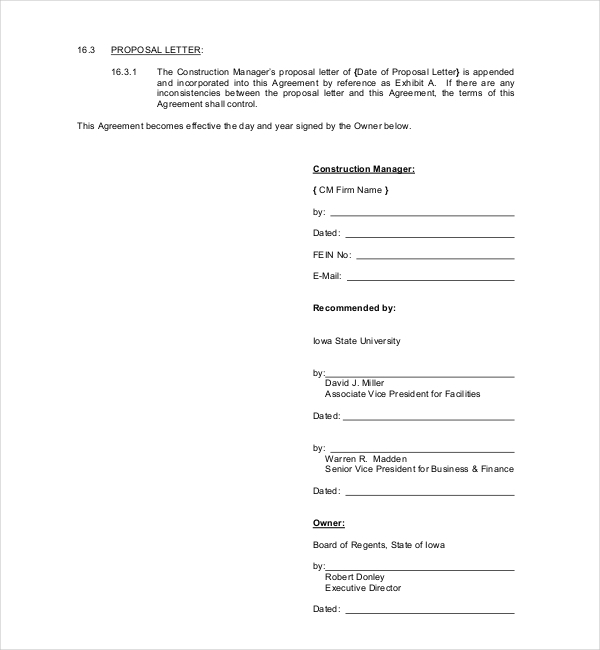 This form is based on the agreement of the construction project in terms of what is needed, agreement between all the parties about the terms and conditions of the project. The agreement is based upon certain laws. This agreement notes down the services given compensation, responsibilities of manager, termination, insurance, indemnification, financial assurance, remedies and other things are noted down. A construction management form is a drafted and signed document which is dealt by the property owner, and a construction forearm. The agreement forms allow one to put down the responsibilities, roles, wages, deadline, and other specifics relating to the project. The goals and expectations are also documented in these agreement forms. 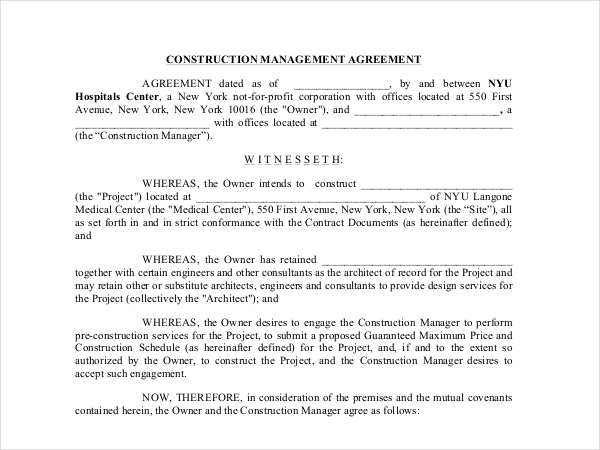 The agreement form deals between the owner and the construction manager ensuring that all the construction process and management goes as per the guidelines. The project quality, the terms and role of the manager, the owner’s needs, site plans, services, project schedule, and preparation of the site, team, and construction contract are discussed in this form. The owner’s, duties, responsibilities and obligation are discussed under the management services. Manager’s services, construction manager compensation, damages and delay, audit rights, miscellaneous provision are discussed here. 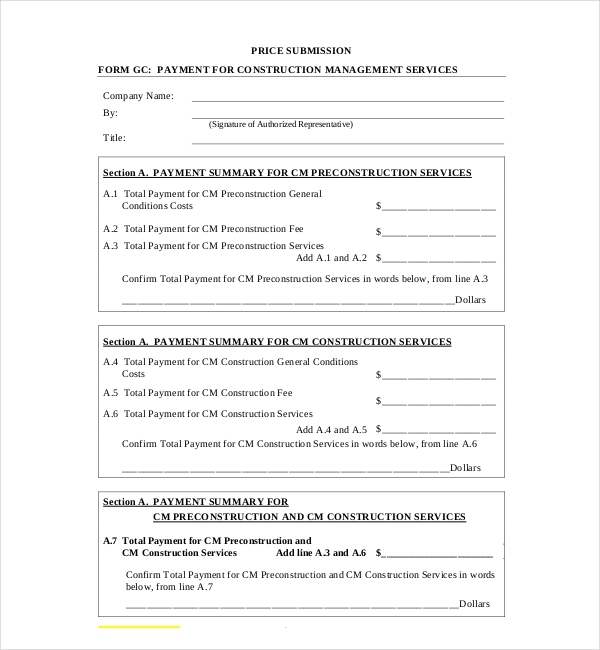 This form is for price submission, payment summary of Construction Management and the preconstruction services. The detail and general condition cost is shown in this form. This is a payment for the management construction that deals with the price related to the construction project team. Some universities provide a program for the construction management to know about the work. 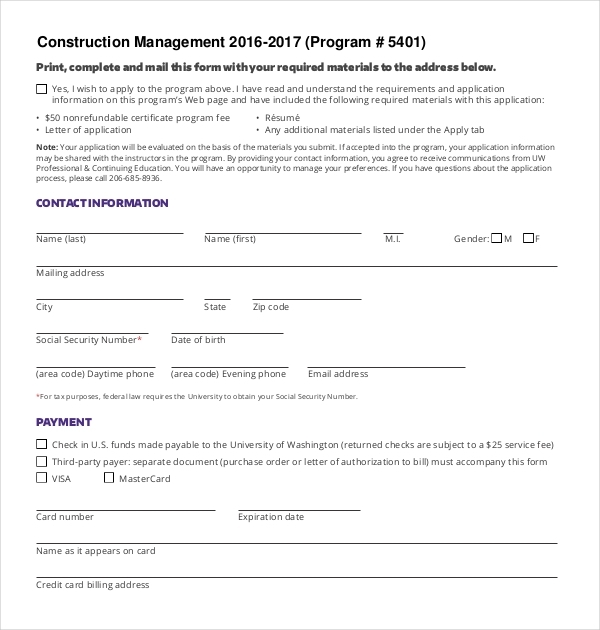 This form is provided by the University of Washington for a certificate program. The contact details are required along with a resume and payment details are to be filled in. This for should be signed a submitted to the university in due time. In the above mentioned form, the risk and safety factors of this project are discussed. From project hazard to work exposure are discussed in this form. The possible risks and prevention must be strictly mentioned so that no further problems arise. It also asks to fill the committee name if the company has any to consult to. Public health safety, project maintenance and many other aspects are looked into through this form. Contractor Performance evaluation form is where a contractor’s performance and productivity in company is noted down. The evaluation is based on the punctuality, productivity, quality of work; participation, subcontractor management, relationship and behavior etc. are noted down by the supervisor. As we already know that construction management deals with the overall control, planning and coordination of a project from the start to the finish. 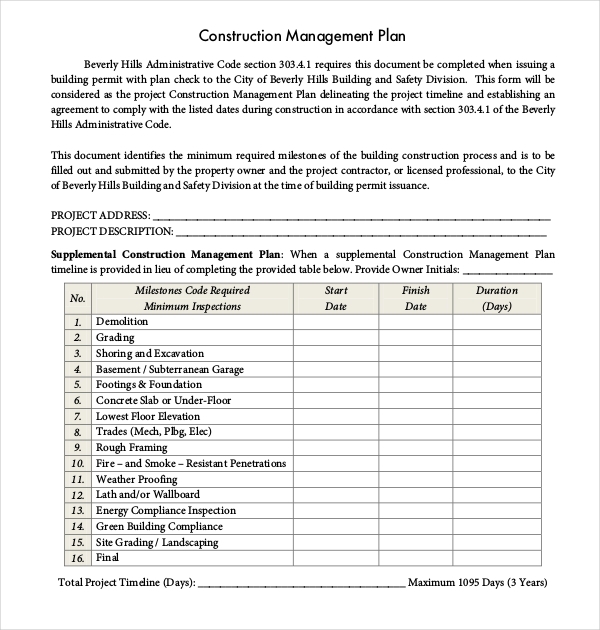 The construction management forms have all the aspects of the plan written down with a contractor’s, property owner’s sign. The forms are used by construction companies for their records. The property owner uses this form for references and records as well. These forms can be used under five sectors, the residential sector, heavy civil sector, commercial sector, environmental sector and industry sector. 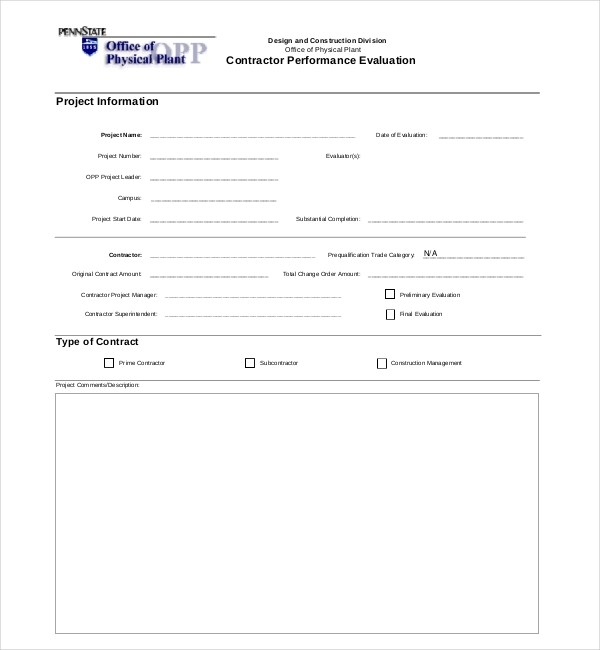 All sectors require such forms so as to discuss the project plans from beforehand. The knowledge of the construction site and types of equipment needed, materials and subcontractors involved and possible location is discussed. These forms are very important for the construction company and property owner. Hence all the information must be valid and real. Any false information may lead to legal offence. The owner can use the form for their own records and make a copy of it. Since a plan takes a lot of time and has the chances of getting delayed, this form can be referred by the owner to revise the plan. The construction company needs to verify all the details before starting the plan. The verification of the land, plan, budget, time, equipment and the overall maintenance of the project is seen by the construction company. Any doubts or suspicion in this plan can delay the approval. There is a possibility that the plan gets cancelled as well due to many reasons. 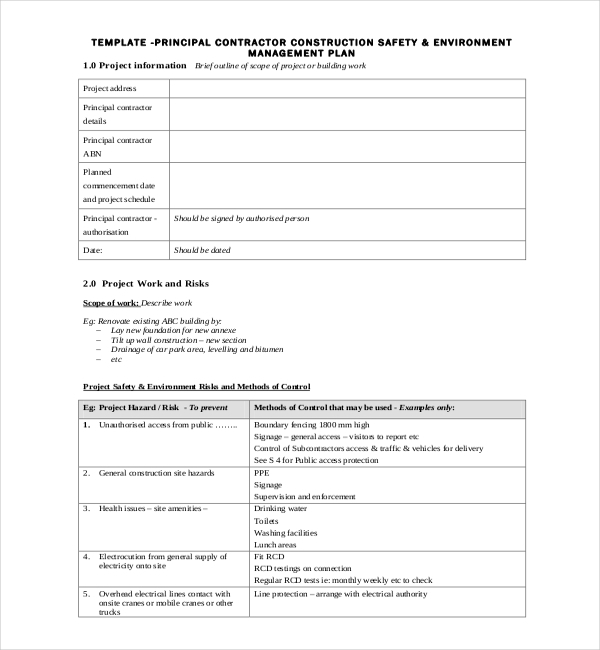 There are some cases where the plan is rejected due to environmental hazards or other issues; hence the construction management forms are required to revise the whole plan accordingly. What is The Role of The Contractor? The contractor is assigned to a construction project once the whole design is complete. This is done by a process of bidding with different other contractors. There is a typical process for selecting a contractor; they are selected based on low-bid selection, qualification-based selection and best-value selection. Specifying objectives of the projects which include budgeting, delineation, scheduling, selecting participants for the projects, setting the performance requirements etc. The development of an effective communication is done by the construction management and the quality to resolve the conflicts is handled by the same. Implementing the various operations through proper control of planning, proper coordination, constructing and contracting the entire process, estimating, design are done by the construction management. The construction management functions fall under seven main categories- cost management, time management, project management, quality management, safety management, contract administration and the contract management professional practices. The advantages of the construction management form are for the legal purposes. The forms can be shown in the court of law as evidence against any false accusations or any other problems faced. These forms have the details of the project plan which make it easier for all the parties to work on. Commercial- Malls, shops, casinos, banks, warehouse, theatre, resorts and other entertainment buildings are built under this category. Agriculture- Animal sheds, storage area, equipment garage, barns, tanks, ditches come under this category. Institutional- Research labs, libraries, dormitories, hospitals, government buildings come under this category. Industrial- Pipelines, sea port, steel mills, power plants, oil refineries and chemical platforms come under this category. Environmental- The construction of storm sewers, water management plant, solid waste management are done under this category. Heavy civil- Dams, water-related infrastructure, roads, rail roads, bridges come under this category of construction types. These forms are available online which can be downloaded and printed. They are available in the PDF and Word Format. These forms are well tailored and are available in higher and lower compatibility versions as well. You can edit the forms as per your needs. The forms have a good success rate, as high as 99%. If you need to further customize these forms we will be happy to help you. The forms have a very high demand because of its usefulness in the construction company. You will find no error in such forms from our website.